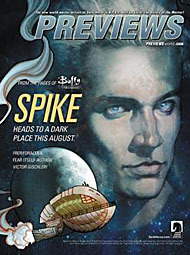 It's time once again to thumb through the toy section of this month's Previews, and see what goodies we can uncover. Scheduled to start shipping in August. The second issue of DC's new Masters of the Universe comic will be out August 1, according to the listing on page 131. Arkham City Series 3 is shown on page 142 - Batman, Ra's al Ghul, Clown Thugs, Azrael and the Penguin. Page 144 has Just-Us League of Stupid Heroes Series 2, with Alfred E. Neuman as Wonder Woman, GL and Flash. IDW's Battle Beasts #2 is listed on page 152. GI Joe starts on page 159, and the Transformers on 161. Halo has a 6" scale line? That's what page 217 suggests. There's a four-figure series, Master Chief in a Cryotube, the Rookie in an ODST Drop Pod, and even a blind-packed, mix-and-match series of buildable avatars. Page 218 also introduces the "Micro Ops" figurines, done in 15mm scale. There are two cool shirts on page 38: a stripey Snake-Eyes one, and Optimus Prime for President. Want to get all the Munsters at once? There's a b/w box set on page 401. Here come the Minimates! Capcom X Tekken and Expendables 2 on page 402, Santa Claus and Venom on page 403. Marvel Select is doing a Rhino figure. And he looks great! See him on 404. DC Mini-MezItz are listed on page 410. Batman Beyond/Cyborg, Flash/Captain Cold, and Dr. Fate/Demon. Want to feel sad, go to page 415 and look at the listings for GI Joe toys we won't see until next year. On the plus side, page 416 has Series 2 of Evil Dead 2, the new Friday the 13th Part 3 figures, and is right next door to the Nightmare on Elm Street Series 3 on page 417. The Marvel Universe listing on page 419 reveals some new characters: Amazing Bag-Man, Beta Ray Bill, Miles Morales, Beast, Kraven and more! Gremlins and Rocky are both listed on page 420, while 422 has Killer Klowns from Outerspace and Predators Series 6. The vintage Star Wars figures are getting new packaging? That's news! See it on page 424. Back in the DVD section, GI Joe Season 2 Part 2 is available on page 482. This entry was posted in Previews and tagged Batman, Evil Dead, GI Joe, Gremlins, Halo, Marvel Select, Marvel Universe, Mez-Itz, MotU, Rocky. Bookmark the permalink.